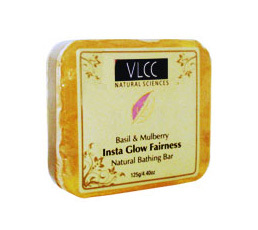 Buy Vlcc Natural Bathing Bar Saop Insta Glow Fairness Basil and Mulberry. Anti Agening Geranium and grapefruit. This unique bathing bar is formulated to provide deep pore cleansing action with moisturizing and soothing effects on the skin. Enriched with Basil Oil, Mulberry and almond extracts, it effectively rejuvenates the skin, leaving skin soft and glowing. 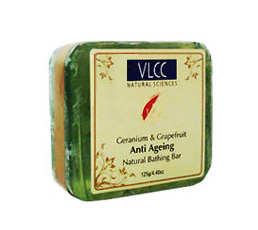 The premium bathing bar with anti agening properties gently cleanses the skin. Enriched with Honey, Vitamin E and Geranium Oil, it effectively tightens the skin without leaving it dry. Reduces lines and wrinkless, leaving skin soft and younger looking.